Ah, the Bowl. Our favourite Hunting Ground. Well actually on a Tuesday night with the LVRC regulars that is. The regular BC Crits can be a bit more dicey and that's where Jason, our newest member has been struggling a touch. He's had a fair bit to contend with since he returned from Asia last Autumn. Firstly, there was the re-acclimatisation. Then, once he'd got used to the cold, there was the training. Then he had to get used to hanging around with us. Then his bike snapped. And after all that, he had to revert to 4th cat as a result of his repatriation. Then last weekend, he phoned in sick and had to miss the Ginger Smallwood Road Race. 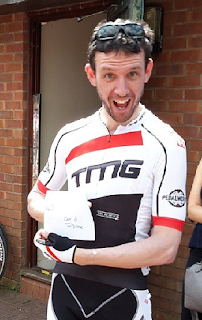 He has joined a few training sessions with our racers, prompting many a prediction and plenty of bike shop counter innuendo along the lines of 'dark horse' etc. But so far, all the talk has passed without placings and it would be easy to lose patience [although patience is something we tend to be pretty good at]. Not easy for our Jason then. But he stuck with it and got used to the format with a few blasts round Hillingdon and The Bowl over the spring. 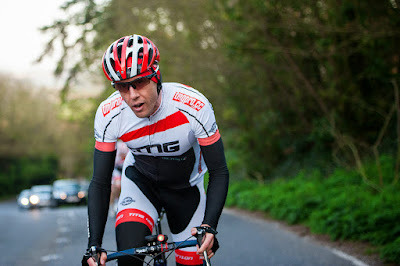 Three weeks ago, he endured a brutal National Masters Road Race which proved there was a decent amount of form to work with. Finally, on Saturday at the Big Events Crit, he decided on a combative strategy; that is to say, he clipped off the front and no-one followed. For another 40 minutes. : "I was a bit disappointed to be on my own," he says. "It was flaming hard work." Spoken like a true road racer. We like wheels to sit on. But he did stay away, netting both the Prime and the win, with a gap of over a minute by the end. "We knew he could do it," Ian Baynes said afterwards. "He's pretty experienced and you can see that he's relishing the training, so I'm sure it won't be long before the next few points drop." Adding his congratulations, Neil: "He wasn't sitting up was he? No slacking there, looking forward to getting him in the next cat up!"